Camden Arts Centre on Finchley Road is just down the road from the Freud Museum, former home to the daddy of psychoanalysis. Sigmund was obsessed with dreams, believing them to be a repository of hidden desires ripe for ripping apart on the therapist’s couch. So it’s a neat coincidence that the CAC has also drifted off to the land of nod with ‘Sleep Rock’, the first UK solo exhibition by American artist Sadie Benning. 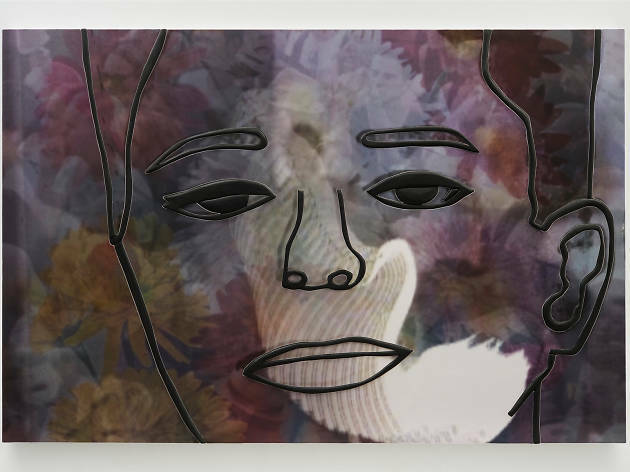 There are 19 new works here, arranged in sequence to resemble film stills, or the individual frames of a graphic novel. The majority of the artworks are small, resin-covered images made up of retro-looking photos and dense, abstract paintings. The rest are large-scale pieces, again made of a mixture of photos and drawings distorted in size. Featuring newspaper clippings of yesteryear’s Hollywood stars, plus an impressive amount of pre-meme snapshots of domestic moggies, these big artworks reiterate the small-town Americana motif recurring throughout the exhibition. But it’s in the shiny, tiny blocks of pop art colour and translucent photos that the dream theme is clearest. Beauty salons, vending machines, pills and faces (loads of faces) are layered under and over semi-psychedelic painted shapes resembling solidified wax drips. It’s like the visual equivalent of that semi-asleep state where your mind flashes up image after image from the day just gone. Only in Benning’s case, it’s not just memories from an individual’s mind, but snippets of info from a whole nation. The American Dream, if you like.